Humans are just another animal. All animals share a core set of several thousand genes and all mammals have about the same number of homologous genes (~25,000). The differences between species such as gorillas, bats and whales are due almost exclusively to differences in the timing of expression of these common genes. This concept is not new. It was the major theme of Stephen Jay Gould's book, Ontogeny and Phylogeny, back in 1977 [Learning About EVO-Devo]. Over the next twenty years or so, the concept was confirmed repeatedly by the work of hundreds of developmental biology labs working mostly with model organisms such as Drosophila (fruit flies). The field is evolutionary developmental biology or "evo-devo" and that work has been nicely summarized in several popular books appearing in the 21st century. 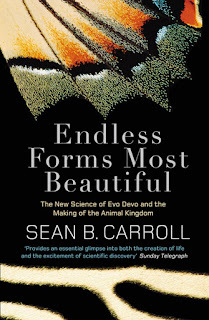 One of the best of these books is Endless Forms Most Beautiful published in 2005 by Sean B. Carroll. I want to quote an extended passage from that book to illustrate the modern view of this idea. We now know from sequencing the entire DNA of a species (their genomes) that not only do flies and humans share a large cohort of developmental genes, but that mice and humans have virtually identical sets of about 29,000 genes, and that chimps and humans are nearly 99% identical at the DNA level. These facts and figures should be humbling to those who wish to hold humans above the animal world and not a part of it. ... We now understand how complexity is constructed from a single cell into a whole animal. And we can see, with an entirely new set of powerful methods, how modifications of development increase complexity and expand diversity. The discovery of the ancient genetic tool kit is irrefutable evidence of the descent and modification of animals, including humans, from a simple common ancestor. Evo Devo can trace the modifications of structures through vast periods of evolutionary time—to see how fish fins were modified into limbs in terrestrial vertebrates, how successive rounds of innovation and modification crafted mouthparts, poison claws, swimming and feeding appendages, gills, and wings from a simple tubelike walking leg, and how many kinds of eyes have been constructed beginning with a collection of photosensitive cells. The wealth of new data from Evo Devo paints a vivid picture of how animal forms are made and evolve. 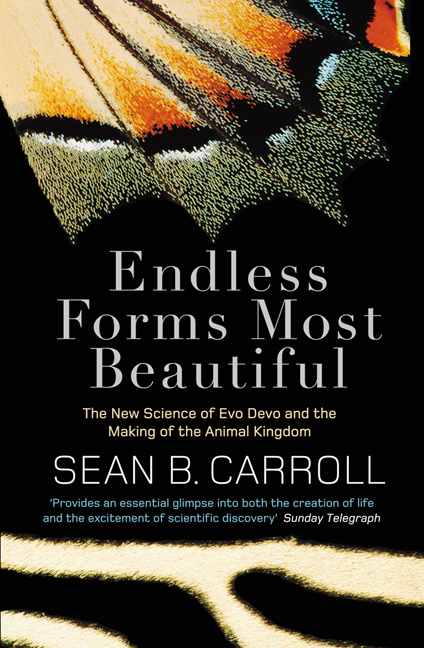 I'm a big fan of Sean B. Carroll (the biologist), not only for his work as a scientist but also for his skills as a writer. His books are intended for the general public but they should also be read by every biology major and every graduate student and every PI. Sean Carroll, and others, are not describing radical new concepts that were only discovered in the age of genome sequencing. They are describing the prevailing view among experts dating back more than half a century. One of the fathers of evo-devo was Edward B. Lewis who made major contributions to our understanding of homeotic genes. Lewis shared the 1995 Nobel Prize with two younger researchers (Christine Nüsslein-Volhard and Eric F. Wieschaus) who did crucial experiments in the early 1980s to prove his ideas [The Nobel Prize in Physiology or Medicine 1995]. By the 1990s every knowledgeable biologist should have known about this work and they all should have understood that humans have the same set of genes as other animals—those genes are just regulated differently during development. By the dawn of the 21st century, no respectable biologist should have thought that human biology was very much different from that of their cousins. Or so you would think. By the 1990s, we had a pretty good idea of the number of genes in the human genome based on work done in the 1960s, '70s, and '80s. The best estimates were about 30,000 genes, a value based on genetic load, mRNA abundance, the parts of the genome that were already sequenced, the resolution of the C-Value Paradox, the size of a typical gene (~30 kb), and the fact that most of our genome is junk (defective transposons). This data was summarized in two papers that appeared in Nature before the human genome sequence was published. One of them estimated that the genome would contain about 30,000 genes (Roest Crollius et al., 2000) and the other estimated 35,000 genes (Ewing and Green, 2000). The first result of the human genome project was the sequence of chromosome 22 published in 1999 (Dunham et al., 1999). The sequence of chromosome 21 was published the following year (Hattori et al., 2000). The draft sequence of the genome was announced in the summer of 2000 and published early in 2001 (Lander et al., 2001; Venter et al., 2001). The complete finished sequence indicated the presence of about 26,000 genes (International Human Genome Sequencing Consortium, 2004). & Junk DNAIt should be obvious to everyone that the knowledgeable experts were correct in their estimates, thus confirming work that spanned a half century. There were no surprises for those scientists who were aware of the scientific literature on the number of genes. Many other scientists were not aware of this data because they had not been paying attention. Most of them were "shocked" to discover that humans had "only" the same number of genes as the other animals. But instead of recognizing that they should have known better, these scientists started looking for excuses to justify their belief that humans must be more complicated in spite of what the data was telling them. The most common excuses were that humans make many different proteins from a single gene because of widespread alternative splicing or that the human genome contains a vast repertoire of undiscovered genes for noncoding RNAs. I call this phenomenon the Deflated Ego Problem. It refers specifically to the "problem" faced by many scientists who cannot accept the evidence that humans have the same number of genes as our animal cousins. This is still a very real problem for many scientists. I was prompted to write this post by a reader who sent me the link to a paper published just a few months ago. Here's the reference and the abstract. The total number of protein-coding genes in the human genome is not significantly higher than those in much simpler eukaryotes, despite a general increase in genome size proportionate to the organismal complexity. The large non-coding transcriptome and extensive differential splicing, are increasingly being accepted as the factors contributing to the complex mammalian physiology and architecture. Recent studies reveal additional layers of functional complexity: some long non-coding RNAs have been re-defined as micropeptide or microprotein encoding transcripts, and in turn some protein-coding RNAs are bifunctional and display also non-coding functions. Moreover, several protein-coding genes express long non-coding RNA splice-forms and generate circular RNAs in addition to their canonical mRNA transcripts, revoking the strict definition of a gene as coding or non-coding. In this mini review, we discuss the current understanding of these hybrid genes and their possible roles and relevance. I'm not familiar with the journal but the title ("RNA Biology") suggests that it publishes the latest research on RNA. It's safe to assume that when a paper is reviewed for this journal the resulting manuscript represents the prevailing view of the RNA biology community. That should be especially true when the paper is a review, as this one is. The abstract reveals a classic case of the Deflated Ego Problem. The authors are worried that there aren't enough protein-coding genes to explain why humans are more complex than other animals. They repeat another myth that I didn't mention: namely, the idea that genome size increase with complexity [Genome Size, Complexity, and the C-Value Paradox]. They fall back on the two most common excuses: alternative splicing and abundant noncoding RNAs. They invent a new excuse; namely that lncRNAs encode a huge number of small peptides (micropeptides) that may account for the "problem." The first paragraph in the introduction is a re-hash of the old myth that experts were "perplexed" by the number of genes in 2001. The earlier understanding on the evolution of complexity in higher eukaryotes necessitated a proportionate increase in the number of protein-coding genes in the human genome compared to the much simpler organisms like worms and flies. Hence, the original discovery that the human genome hardly contains 30,000 protein-coding genes, not much more than found in the genome of the worm – Caenorhabditis elegans was perplexing. I do not understand why this false view of history is still repeated in the scientific literature. I understand why some scientists might have been surprised by the result in 2001 but it should be clear that there were experts who did NOT think that complexity was caused by more genes and, as it turns out, the data showed that the experts were correct. You may not want to admit that the evo-devo view of evolution is correct and that's fine, but please don't ignore it. The best you could say is that you reject the obvious explanation that was confirmed in 2001 and you cling to the old idea that there should have been more genes in the human genome. Then the onus is on you to: (a) refute the evo-devo explanation, and (b) show why the data supports your view of evolution. Both are required once you know that there's a competing explanation that accounts for the data. It's 2018—there's no excuse for not knowing what the experts were saying in 2001. Instead of showing why the evo-devo explanation is wrong, the authors try to explain how new data solves their deflated ego problem. These miscalculations originally arose due to the devaluation of the significance of the non-coding parts of the genome, often referring to them as junk DNA. It is interesting to note that a typical bacteria harbors protein-coding genes in approximately 90% of its genome, while greater than 95% of the human genome does not code for proteins. By current estimates, the short and long non-coding RNA genes in the human genome out-number protein-coding genes. The importance of tRNAs and rRNAs as decoders of the genetic code was evident. However, the other spectrum of the non-coding transcriptome is slowly being characterized. Novel functions of these short regulatory RNAs and the more cryptic long non-coding RNAs (lncRNAs) are constantly being discovered. These non-coding transcripts could be the missing link in explaining the complexity achieved by mammals, despite having similar number of protein-coding genes to that in invertebrates. Roles for lncRNAs in complex processes unique to higher eukaryotes like neuronal development and cancer metastasis support this notion. Alternative splicing is another factor contributing to the functional diversity and complexity of the proteome as well as the non-coding transcriptome. Differential splicing can give rise to multiple mRNAs from a single gene, coding for polypeptides displaying distinct sequences and functions. The problem with this explanation is that it's all speculation, not fact. There is no solid evidence that the human genome contains more than 20,000 genes for noncoding RNAs. In fact, there's every reason to believe that there are no more than a few thousand and most of those are present in other mammals. There's no solid evidence that alternative splicing makes a significant contribution to functional diversity. Some genes produce different protein variants but those genes are conserved—other animals exhibit the same "diversity" and complexity of the proteome. It's likely that true functional alternative splicing applies to fewer than 5% of human genes. The term ad hoc is Latin and literally means “for this purpose.” It involves the addition of more premises in an attempt to save a particular belief or position. By itself, adding more propositions is not fallacious. It becomes fallacious, however, when one’s new propositions do not possess convincing evidence but merely reflect a person’s biased ties to the cherished belief of position. ... those ignorant of history are not condemned to repeat it; they are merely destined to be confused. Ontogeny and Phylogeny (1977)Note: As a general rule, when scientists harbor misconceptions in one area they often exhibit a profound lack of knowledge in other areas as well. Among those scientists who suffer from the Deflated Ego Problem, there's a high probability that they are also confused about the Central Dogma of Molecular Biology and they are often ignorant of the history of junk DNA. The general skepticism in accepting concepts which deviate from the central dogma of molecular biology was the main reason for ignoring the importance of the non-coding regions of the genome as "junk DNA." We have come a long way forward and the non-coding transcripts are now receiving the attention which they deserve. The Central Dogma of Molecular Biology says that once information is transferred to protein it can't flow backwards to nucleic acid [More confusion about the central dogma of molecular biology]. It had nothing to do with the discovery that most of our genome is junk. Evidence for junk DNA came from a number of converging efforts in different fields [Five Things You Should Know if You Want to Participate in the Junk DNA Debate]. Furthermore, no knowledgeable scientist in the 1970s ever dismissed all noncoding DNA as junk and none of them were ignorant of the important roles of noncoding RNAs or of essential elements that had nothing to do with genes [Stop Using the Term "Noncoding DNA:" It Doesn't Mean What You Think It Means]. wjether god or man I doubt anyone ever said humans were created differently then the rest of biology. We are above the rest because of the immaterial soul. A more careful concept of biology these days called common design ALSO would predict/welcome us beimng close to mice in DNA. iN fact it dampens the chimp/man dNA likeness that is used to probe common descent of both. AHA all biology is just a skip and a jump different from the rest. if god created biology on creation week then how else would he d it? why not the same laws in biology as in physics? We are not humbled by biology parts department numbers. 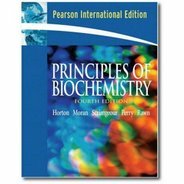 biology is humbled by a unique being within biology doing the biology.! Saying that fins led to arms because of likeness in DNA is just saying the same thing. Fins are not much different then arms. nOPt much atomic numbers/dna different. yet its not evidence of common descent. comparative studies in nature only compare. its the humans who draw a further conclusion that it means a common descent. common design fits fine. i don't see, anyways, comparitive subjects as biological subjects or rather biological processes/results subjects. another issue. I f God created biology on creation week then its a option the biology would be based on a blueprint and twists from it. In fact if evolutionists insist like biology nullifies a creator concept then they should provide what would of been a better biogoly construction. What would they of done!! Sean Carroll is plain wrong in rejecting the creationist(s) model. he pushes a creator into a strange corner on how to go about creation. It's interesting how the creationist models have changed over the past two thousand years as they get modified to fit the scientific evidence. The current version looks a lot like evolution except that god(s) did it and just made it look like their role was unnecessary. Yes. All that matters is the very basic boundaries. then people try to make it work and mess it up. yet its still true and we do less messing up now. its relative. Yes creatyionism needs biological mechanisms that works without a creators involvement. god never created anything after the sixth day. nothing. yet nothing in biology looks the same or even close. People are YEC great example of how we welcome adaptation/change in a original same looking population. For non people its greatly more and welcome. Biology is so glorious in its complexity we have a intellectual right to imagine mechanisms that are not obvious. YET they must be there. Human looks to me is the great case and I never find evolutionism is confident in explaining it. Having selection constantly on small numbers of parents to explain human differences, including extinction of the rest, seems unlikely and so they shy from the subject. Creationists shy away too. in fact when i say its clear that humans are different species everyone, really everyone, says NO We are one species. Impossible! the mechanism has done its deeds and created new populations. This is the origin of species. nature does not have a purpose to create species and so reproductive ability is irrelevant in defining species. This should be obvious. (Yes this time). Otherwise differences in peoples are not based on a mechanism. So how did it happen? 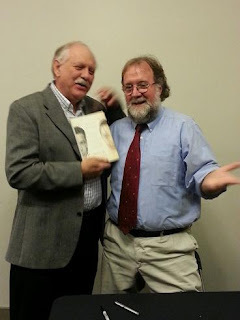 Is evolutionism denying humans evolved into present looks from a original common look? What is the origin of species? What is the mechanism ? Yes there is a mechanism to inprint on the dna of a new population. Therefore it is true humans are divided by species. I wonder how much of this is driven by much of 'basic' research in the US at least, being driven through medical schools and a human health perspective. Based on my understanding, MDs and MD/PhDs are not required to take evolution or ecology classes as undergraduates and focus on those classes that 'best' prepare them for medical school, which means the majority of their training and perspective is the human condition. I think this leads to the idea that the human condition is the only condition, so why read papers on yeast, E. coli, plants, archaea, etc. Basically I am not surprised to see more examples in the literature of researchers have little to no appreciation for historical knowledge. As humans, we have a rather vested interested in understanding our own inner workings and our potentially hazardous interactions with other natural forms and processes. Thus, in this modern day, research priorities of federal research funding agencies are highly biased towards medical or bio(human)medical research. Research journals amplify that bias through anthropocentric editorial decisions on what gets published or not, and the media delivers the coup de gras, trumpeting primarily, if not exclusively, those discoveries that have a "human" angle (except for that Zimmer guy). You *don't* think humans are exceptional? Other species have sent rockets to the moon, mastered quantum physics, triggered nuclear fusion and invented the internet?